We can't resist showing you this one: the "Deer in the Headlights" Photo! It's probably the worst photo ever taken of the three of us. 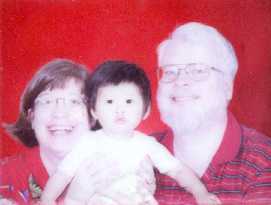 It's our official adoption photo taken by polaroid at the registry office in Changsha, Hunan. It's washed out, overexposed, and really awful of Tam and Michael. But Xiao Chao's black hair and eyes stand out so dramatically, we couldn't resist putting it up. Besides, it's our official adoption photo.